The first date card of the season is for a group date to find "husband material." Well Whaboom was invited, so that seems like a stretch. Rachel brings the guys out to the "Husband Material Challenge" obstacle course with a surprise: Bachelor fans/celebrity supercouple Ashton Kutcher and Mila Kunis are hosting! Ashton and Mila are so into being on this date, with Ashton insistent that none of the guys on this date will be Rachel's final pick. The obstacle course is pretty hilarious, having the change a poopy baby, vaccum while holding the baby, cleaning out clogged drains (and nearly drowning the baby dolls), and setting a table. Unfortunately, Whaboom Lucas wins and basically all he wants is a celeb to say his stupid catchphrase. Hard no from Ashton. In terms of location, the night portion is so cool with this lounge surrounded by old video games, lawn chairs, etc. Actually, it might just be a prop wearhouse. But it's still cool. Rachel is surprised Lucas was so into winning the challenge, which included pushing Kenny out of the way to win, and even more shocked by the poem he wrote for her. But guys, Blake says from a previous "encounter" (AKA another reality show they were both on) he knows Lucas is fake and not here for the right reasons. Not to mention, Blake's roommate used to date him. Rachel's pretty bored by the convos with her guys which is showing zero luck for romantic prospects. Thankfully, things turn around with Dean who infamously said "Once you go black you never go back." Rachel's disappointed she didn't get to say that first, but her convo with Dean is natural and fun amongst a night of duds. She also hits it off with wrestler/single dad Kenny. Rachel gives the group date rose to Dean, who offers to walk her to her car and then ends the night with a romantic kiss. So the group date wasn't a total flop! Peter gets the first 1-on-1 date card but he's not alone with Rachel: Copper the dog is joining! The trio board a private jet to Palm Springs and drive to Barkfest, with the most adorable doggos ever having a great time. Rachel and Peter hit it off, and most importantly Copper likes him. After Barkfest, it's off to a private dinner complete with a dog bed for Copper. He might be the first in existence to eat on a Bachelorette date. Rachel asks what Peter's parents think about him going on this show and they're so supportive. They also discuss a common trait they share: gap teeth. Also seeking therapy to help with their relationship problems and questions. Rachel is so excited to feel romance and an amazing connection with someone. Rachel gives Peter the date rose and they share a kiss, then head outside to watch fireworks just for them (with more kissing). No idea if Copper was a fan of the fireworks. Rachel brings in NBA legend Kareem Abdul Jabbar to put the men through some basketball drills and training. But training isn't great TV (except when DeMario dunked on Rachel) so the guys are split into two teams to compete in front of a crowd. And they're horrible. Like really bad. But there's teamwork! And Chris Harrison randomly appears to be the game's announcer. After the game, fans come up to get pictures and talk to Rachel, but there's a lingerer named Lexi who has some important news. Turns out DeMario, who Rachel is totally smitten with, is this girl's boyfriend. No breakup; just ghosted and went on national television to date Rachel. Rachel is shocked because DeMario's a guy she's pretty been pretty into. DeMario's jaw is dropped as Lexi goes off on him and he tries to defend himself. There's questions of if keys were returned, when contact ended... it's a mess. Rachel isn't buying DeMario's side of the story and the text messages only a bigger grave. 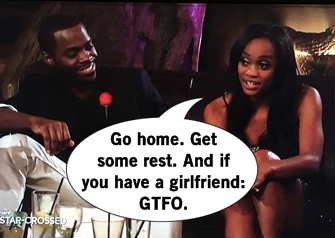 Rachel isn't here to be made a fool of and dumps DeMario on the spot. Despite a rough day on the courts, the group date persists on for cocktails. Rachel worries that there are more guys with bad intention there but the guys step up to show they care for her. This group date has far better conversations than the husband material date. Josiah comforts Rachel and they share a kiss, but Alex makes Rachel crack up with some awkward singing. Eric gets a smooch in too. 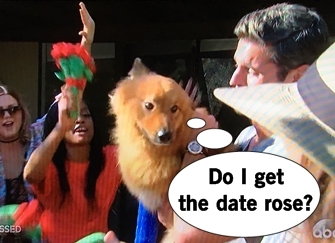 It's Josiah that gets the group date rose after the deep conversation they shared. And that's what we call a slam dunk ending. Fast forward to the next night where Rachel wears a gorgeous black gown with gold trim to the cocktail party. First impression rose Bryan didn't have a date but grabs time with Rachel right away to kiss, catch up, and give her a relaxing message. 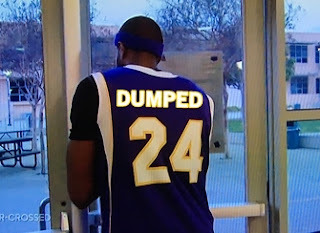 But there's not much time to relax when a guy shows up at the front gate hoping to talk to Rachel: it's DeMario! He wants to apologize so Chris Harrison is off to relay the message. A curious Rachel heads to the front gates but we'll have to wait until next week to hear the conversation.